Ariete Espresso Makers Buying Guide. 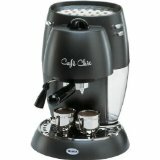 Items include Ariete Elisir Cafe Model 1331, Ariete by DeLonghi Pump Espresso Maker DCM1377 in black, Ariete by Delonghi Pump Espresso Maker 1377 in Champagne Color, and Ariete Capricci Capsules. Ariete by DeLonghi Pump Espresso Maker DCM1377 is a 15 bar machine with a self-priming pump. Features a steam-pressurized safety cap, for lattes and cappuccinos it has a swiveling jet frother & a thermo-cream system and a maxi-cappuccino systems. Also provides a tray to warm your cups so they are ready to go. 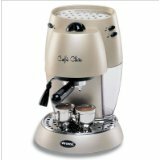 Ariete by Delonghi Pump Espresso Maker 1377 in Champagne Color. Has the same features as the one above in Black. These machines are manufactured in Italy and have a stylish retro-flair look. Ariete Capricci Capsules are compatible with the Ariete Machines such as the MC-50, Elisir, and the Florence Charme. Capsules are made with an excellent Italian coffee blend. Each bag contains 2 capsules. Ariete Elisir Cafe Model 1331 has 850 watts of power with 15 bars of pressure. The water reservoir is removable and has a 1.1 litre capacity. The Thermocream System has a filter holder. Features include a Maxi-cappuccino device, self priming valve, drip container that is removable, and a steam adjustment lever. The unit weigh 4.1 kilograms and measures 268 mm by 293 mm by 340 mm. Comes with a 2 year warranty and is manufactured in Italy. Compact, easy to use, easy to clean. Pros: Machine makes a wonderful crema, it is inexpensive, and froths milk well. Cons: Cheap plastic body and the frother is too low. Summary: Nice compact and inexpensive machine from Italy.